While many parents jokingly refer to the television as the “babysitter,” the sad truth is that in reality, many parents use it for just that. 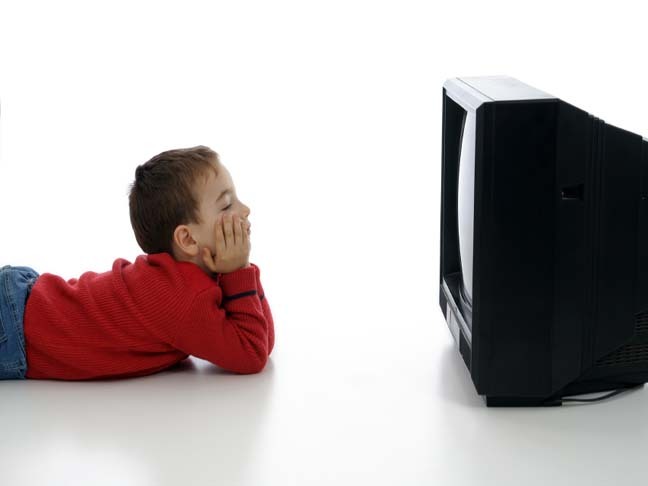 While the American Academy of Pediatrics recommends that children under age two watch no television at all and that older children’s screen time is limited to no more than one or two hours per day, many children are exposed to much, much more than that. In fact, the Kaiser Family Foundation reports that 2/3 of infants and toddlers spend an average of 2 hours per day in front of a screen. According to the MayoClinic.com, too much screen time has been linked to obesity, irregular sleep, behavioral problems, impaired academic performance and less time for active and creative play. can help reduce the amount of time your child spends in front of the screen. While it’s important to be watchful of how much time your child spends in front of the screen, it’s also important to be mindful of the material he watches and the games he plays. In addition to being exposed to commercials, alcohol and drug use, according to KidsHealth.org, the average American child will witness 200,000 violent acts on television by age 18. Since shows and games with violence directly and indirectly may promote violence, continued exposure can desensitize children to violent acts and contribute to aggression. When choosing what media your child ingests, consider your family’s values and the show, game or DVD rating. Choose media that is age-appropriate for your child and media that aligns with your family’s moral code. Let’s start the discussion. How much screen time does your child have each day? How do you choose what your child watches or what games he plays? Do you prescreen movies before your child watches? Do you feel commercials or violence affect your child’s behavior?